Oh wow bloggers. Have I got a great competition for you! How would you like to win £1000 of John Lewis vouchers? Of course you would. And not only that, I have a 2nd prize of £500 and a third prize of £250. The blog, The Swelle Life and I are offering you this fabulous competition via Cunard, and their Mediterranean Cruises. 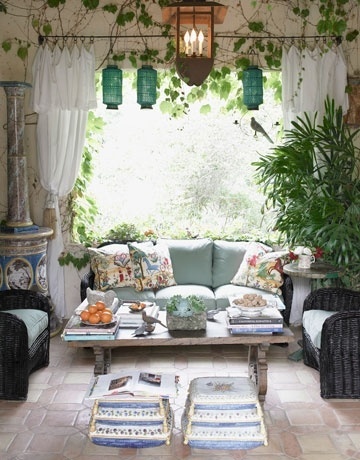 The mediterranean interiors look has to be one of my favourites. It’s timeless, elegant, and colourful, and inspires all kinds of romantic moods. You can bring it into your homes with ease, as well as your garden of course, and for this competition, we would love to see how you would do it. All you need to do is hop over to the Cunard Mediterranean destinations page, pick your favourite and then create a Pinterest Board with images that remind you of this port of call. Of course, I would love it if they were home and interiors focused, but they don’t have to be. Just make sure they really give me a sense of that destination. You might like to choose St Tropez in France, or Rhodes in Greece or how about Turkey, Tuscany or Italy. There’s a huge list to choose from, so you won’t be stuck for inspiration, that’s for sure. Once you’ve created your board, create a blog post explaining your choices. Then come back to this post, and link it up in the comments below. Denise from the Swelle Life and I will be working together to choose a 1st, 2nd and 3rd place from all of the entries across both blogs. We’ll be looking for interesting, original and creative moodboards so do give it your best shot. Follow Jen Stanbrook www.lovechicliving.co.uk’s board Cunard Mediterranean Competition on Pinterest. See the full Terms and Conditions, and further information on the WeAreCunard website here. 1. Take a look at the Cunard Mediterranean destinations page and choose your favourite port of call. 2. Create a Pinterest board using images that give a true sense of that area. Wow, what a great competition – I’m busy pinning now!! I have really enjoyed putting together this Barcelona inspired mood board, and have used ideas from the architecture and artistic culture of the city. I hope it inspires you as much as it inspired me! I have had lots of fun getting lost in the romance of Tuscany. What a great and inspiring competition! – Thanks for running it! My pinterest board is based on French Rustic – having been inspired by the Toulon Cruise. What a great introduction to your blog and Pinterest…I could get addicted to pinning! Here’s my blog post http://www.time-to-be-an-adult.com/2014/06/santorini-or-bust.html and Pinterest board http://www.pinterest.com/calanderyou/satorini-inspiration-for-cunard-competition/ – Good Luck everyone! Fantastic competition with a brilliant prize. Such a fab and fun competition. Here is the link to my blog post. This was so much fun! What a great competition. I have completed my Dubrovnik inspired Pinterest board and blog! I hope you enjoy! I loved making my mood board and now I’m wishing I was on holiday somewhere in the Med! I chose Istanbul, Turkey as my source of inspiration. Fabulous competition – here’s my blogpost (with a link to the Pinterest board) : http://madhousefamilyreviews.blogspot.co.uk/2014/06/cunard-mediterranean-destinations-kusadasi.html Great timing because we’re off to Kusadasi this summer – can’t wait now ! This competition has given me serious Wanderlust now! Here is my entry, I had so much fun putting it together, I wish I was really going to Seville! It has given me lots of ideas though for when I move into our new house. What a great idea for a competition! This has brought back so many memories for me, I am a little overwhelmed! Hello I have had a great time going back a few!! years in my A Trip Down Memory Lane! I had a lot of fun pinning. Here is my link to my Pinterest board as well! How do I set up a blog post? I loved this competition, it was so fun! My board is on Corfu and I chose Corfu because it has always been one of my dream destinations. I dream of staying in a classic Corfu villa with a large Mediterranean kitchen, a patio area for dining alfresco and of course, beautiful wooden beamed ceilings. This is my board here – http://www.pinterest.com/kirstyschoice/corfu-greece/ – and my blog post here – http://studdedpyjamas.blogspot.co.uk/2014/06/cunard-cruise-pinterest-competition.html. Thank you for hosting such a fabulous competition! This is my dream arts and crafts room for kids inspired by the art and architecture of Barcelona. This is my Gibraltar inspired board, a great place to visit that is a real mixture of cultures. totally gutted i missed the bit about writing the blog post to explain my choices! I spent ages doing the pinterest board 🙁 Silly me for not reading it through properly as i just focussed on the 3 points at the end. Is it too late to explain my choices now?